The MDI Biological Laboratory is located at 159 Old Bar Harbor Road, Salisbury Cove, Maine. Kinne Library is on the lower campus in the Morris Research Building. Maren Auditorium and Dahlgren Hall are on the upper campus by Old Bar Harbor Road. The MDI Biological Laboratory is 6 hours northeast of Boston and 3 hours northeast of Portland, Maine. Take Route 3 East towards Bar Harbor/Acadia National Park. After crossing the bridge onto Mount Desert Island, bear left on Route 3 towards Bar Harbor. In 4.3 miles, turn left onto Old Bar Harbor Road. The MDI Biological Laboratory is 300 feet ahead on the left. 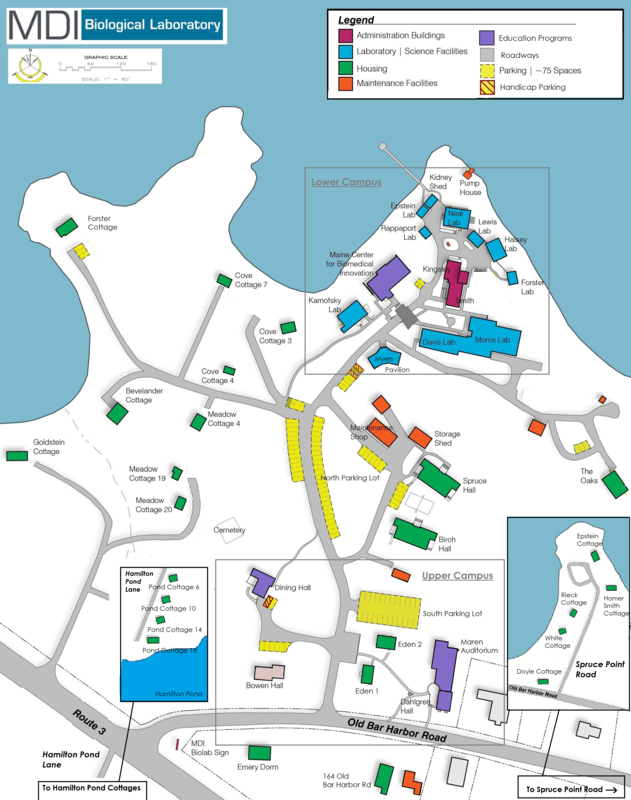 The MDI Biological Laboratory is served by Hancock County-Bar Harbor Airport (BHB; 10 minutes away) and Bangor International Aiport (BGR; 70 minutes away). Free local transportation is available from late June to Columbus Day on the Island Explorer buses.